It is a lamentable fact that, of the many thousands of films made in the silent era, only an estimated one in ten survives today. In cultural terms, this loss alone would be bad enough were it not for the pervading fallacies about silent films themselves that still persist. These fallacies have a real, active danger of affecting reception of silent cinema for those who have yet to experience the delights of the Keystone Cops, the technical inventiveness of Georges Melies or the sheer beauty of Sunrise (Murnau, 1927). It is my view that literature covering this silent period must, as a matter of necessity, explicitly address the prevalent fallacies. Thus, the books that have appeared (and continue to do so) regarding silent cinema have an important task in hand -- to inform, to educate and, above all, to inspire. Early Cinema -- From Factory Gate to Dream Factory starts from almost a losing position, for (as is freely admitted in the preface) ‘its bias is predominantly British’. There is nothing wrong with this condensed approach (indeed, a mammoth book that endeavoured to cover the entire pre-talkie production worldwide would be a major task) but to produce ‘an appropriate introduction to the study of Early Cinema’(preface) and largely omit the crucial role played by France and the United States (to name but two countries) seems oddly paradoxical. There is also no mention (in the section referring to ‘the great man theory’(27) of William Friese-Greene (1855-1921), surely deserving of a mention here, as he is often unjustly overlooked in more general accounts of cinema’s early development. Moving away from the slightly problematical nature of the book’s coverage, the text is divided into five main chapters (covering ‘Cinema 1895-1914’, ‘Approaches to Early Cinema’, ‘The Uses of Cinema’, ‘Exhibition and Reception’and Film Form: Genre and Narrative’. These chapters average twenty pages each, but are then further divided into many smaller pertinent aspects, such as ‘Why Study Early Cinema?’, ‘Critical Approaches’and ‘Technological Determinism’). Although this makes the book less daunting, and, by extension, easy to dip in and out of, it can create a rather ‘loose’, haphazard feel to the text and the information within it that is exacerbated by the absence of an index. Thus, looking for specific information about Robert Paul entails a trawl through each section, rather than flicking directly to the index. Perhaps the idea is to engage the reader and avoid the book being used as a mere reference tool. Whatever the reason, it only serves to alienate the reader looking for follow-up references to any point of interest. The range of the book is vast in terms of its ambition but it does not always succeed. However, a very useful chronology of key dates in the first chapter clearly outlines important developments that are of use to both the casual reader and the committed film historian, thereby fitting in with the ‘appropriate introduction’cited earlier. Later in the section entitled ‘Understanding Early Film Spectatorship’, the authors refer to ‘the heterogeneity of layered performances and performance styles’and ‘the increasing significance of personality to the successful film institution’(68). Occurring as it does just into the chapter allegedly assisting comprehension of ‘early film spectatorship’, this is an academically dense complication which is as wordy as it is unnecessary. The book as a whole suffers from being seemingly caught between desiring to produce a detailed academic study of early cinema to interest the ardent film historian and seeking to provide what it sets out to do by using the word ‘introduction’. Although Popple and Kember do provide a useful ‘Sources and Resources’section, which brings early cinema into the digital age by citing useful websites, they do not tackle the basics in sufficient depth, as has previously been argued. Under the heading ‘A Primitive Cinema?’in chapter two, the following is to be found ‘- ‘without a wide range of contextual knowledge, the small fraction of early films that still survive are of limited value’(33). In common with much of the rest of the book, this raises more questions than it answers, the major reaction being that this is blatantly untrue. One can marvel at the imaginative creativity in Williamson’s The Big Swallow (1901) and appreciate its blurring of the spectator/performer divide without needing ‘a wide range of contextual knowledge’. Likewise, Hepworth’s How It Feels To Be Run Over (1900) is both amusing and surreal -- it does not demand any prior knowledge of Hepworth or his production background. Films can gain from a more detailed knowledge (Bamforth’s The Biter Bit takes more than inspiration from the Lumieres L'Arroseur Arrose for example), but they can be appreciated per se as artefacts precursing what follows without having to be analysed with strict reference to a pre-existing structure of ‘contextual knowledge’. Overall, Early Cinema -- From Factory Gate to Dream Factory promises more than it delivers -- it would have been nice to see more illustrations of early cinema’s coverage in contemporary media and even a case study of how cinema developed in a large city (say Manchester) and a less industrial part of the country. In a more measured, stimulating approach, mention could also have been made of British exhibition (The Gem cinema in Great Yarmouth, which opened in 1908, for example, was the first electric cinema in the country), as opposed to the eclectic collection of oddments which constitutes this necessary attempt to provide ‘an introduction’to early cinema. There is a pressing need for a book which not only provides a clear overview of early cinema for the interested observer but takes this further to interest the film scholar, but, unfortunately, this is not yet it. 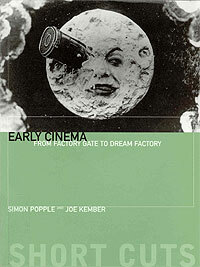 'Early Cinema - From Factory Gate to Dream Factory' is published by the Wallflower Press.